We profile not-for-profit treasurer and Diploma of Business (Governance) student Sinead Glennon, and the great resources she's sharing as one of three winners of the 2017 Commonwealth Bank Not-for-Profit Treasurers' awards. On the back of winning the award, Ms Glennon accepts she may be new to Australia, but the Irish-born accountant says lessons in financial sustainability for not-for-profits are the same the world over. The other two major prize winners, winning $5000 for their organisations, were Bruce Clarke, of the Melbourne Mustangs Ice Hockey Club, and Kaveen Bachoo from Hepatitis Queensland. Ms Glennon, like many volunteer board members in the not-for-profit world, has another life as a professional. And luckily for us, that profession is accounting. Having worked for a global firm as a management accountant in charge of major projects, one of her first tasks in Western Australia was seeking a not-for-profit that could make use of her skills. She applied to the Genetic and Rare Disease Network (GaRDN) for a role as a general board member, but it didn't take long for the Perth-based information and referral service to home in on her formidable financial abilities and recruit her as its new treasurer. GaRDN aims to connect, inform, support and empower, as the peak body for genetic and rare disease support groups in the west. It promotes awareness of genetic conditions and their impact, encourages research, and connects people with support groups. Ms Glennon has helped the network review its budget, forecasts, income, controls and policies, with a view to its long-term financial stability. The assessment system she used to help GaRDN is similar to one she uses for clients of her accounting firm, Opportuna. Now all ICDA members have a chance to benefit from Ms Glennon's expertise, via her entry in the annual Not-for-profit Treasurers' Awards: a financial health check for not-for-profits. Ms Glennon said her desire to enter the Not-for-profit Treasurers' Awards came from knowing first-hand the tough role not-for-profit treasurers face. "I designed this checklist because I believe that the role of treasurer comes with a significant workload and great responsibility. But lots of treasurers take on the role with little or no accounting knowledge or business experience." This can be daunting enough, but those challenges are often compounded by "minimal" handover or limited training. The checklist helps paint a "snapshot of the financial health of the organisation" by focusing the attention of treasurers on key questions on income, expenses, profitability, cash flow and liquidity. If any of these areas aren't properly managed, they can spell trouble. Even if you manage to score in the healthier 75%-plus range on the checklist, Ms Glennon stresses there's no room for complacency. Ms Glennon said there shouldn't be any "don't knows" in your answers. "These are all questions that treasurers should be able to answer, or information that they should have available to them," she said. Her health check avoids the ratios often used to measure performance. "You don't need to get bogged down in financial ratios and terms to understand your finances," she said. "This survey should focus your mind on what you should know. What areas of information you should be accessing, and what you should be able to answer about your finances. "It's all about planning, about access to information, reviewing the information you have to hand, putting a budget in place, then reviewing that budget against your operating day-to-day." Critically, she says, financial sustainability is about effectively controlling costs. "You get people who are so focused on fundraising, and getting money in, that they forget the bottom line. And so you may get new income ... but that will be eaten away very quickly if you don't manage the costs." The tool should also help NFPs better demonstrate the financial transparency that donors and funders now expect. While not-for-profits don't have the same goals as big corporations, Ms Glennon says organisations shouldn't be shy to recruit professional help through such tools as ICDA's board-matching service, which is how she was appointed to GaRDN. "If you were working for a big corporate, you wouldn't embark on a project without engaging several different levels of advice before doing anything, including employing a teams of experts in finance, compliance or risks." While a lack of resources, training and other limitations were significant differences between big companies and non-profits, "I think that some not-for-profits don't tend to ask for expert help soon enough". "There's so many people like me, who just want the experience, like doing it, and want to give back, and a lot of organisations are prepared to give pro bono help, but a lot of non-profits don't know that and won't bother to ask, " she said. Talking of which, we encourage you to set aside some time to make good use Ms Glennon's knowledge and do her survey now. 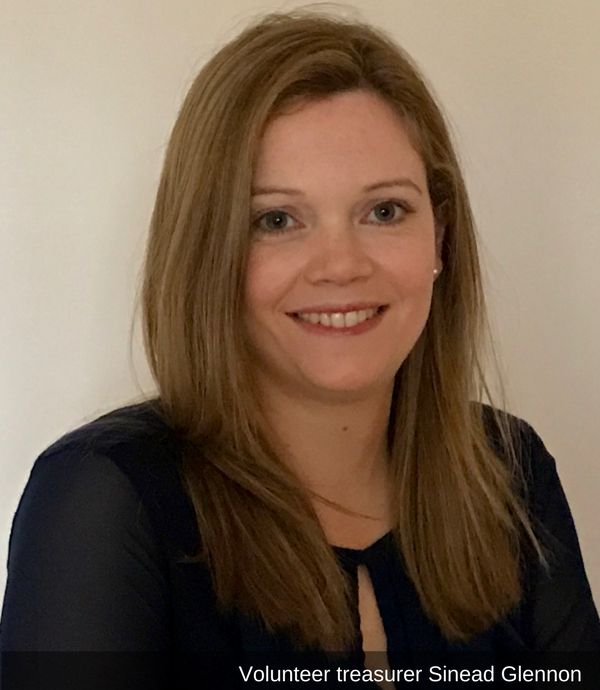 Sinead is already well qualified, with a degree in international marketing and languages, as well as being a chartered certified accountant. But despite executive board experience, Sinead said she was drawn to learn more about community directorships. "Before we moved over to Perth I'd started doing corporate volunteering, skills volunteering, in Ireland, partly because I was tired of just donating money. "My boss had suggested 'volunteer directorships' for charities in Dublin and I really enjoyed that. After knowing we were moving to Perth, I found the Institute of Community Directors website, and thought it was brilliant. I loved the way you could apply for the different positions, and then it had all the policies." The diploma has been useful professionally and in her volunteer work, especially the studies of stakeholder analysis, representing organisations, and winning funding, she said. "Being an ICDA member has opened up a whole new network for me, which is important for sharing knowledge, experience and expertise within the non-profit sector. The institute has also been a vital resource for policies, advice and some very useful templates." The Diploma of Business (Governance) is Australia's only currently approved diploma-level governance qualification.